I accidentally took a very long blogging break. For the past 2+ weeks, my entire family has been battling sickness! It’s just that time of year. The worst was when I got sick earlier this week. I am getting over a horrible case of tonsillitis. Thankfully I’m on the mend and no longer contagious, but I’m still feeling uncomfortable and looking forward to getting back to my routine. I’m in a fitness group on Facebook and one of our tasks this past week was to post a quote that spoke to us. This was the one I posted. It really speaks to me as a runner. Yes, I’ve done a couple 5k’s and I do try my best at my Orangetheory Fitness classes, but I am not the best runner, despite approaching my 1.5 year mark of downloading the Couch to 5K app for the first time. I STILL find it very difficult to run without taking walking breaks. I STILL find it hard to maintain anything faster than a 15 minute mile or so. Some people may not even call that running! LOL. At Orangetheory, when we do run/row segments where we have to run a specified distance and then row a specified distance, I jog (slowly) on the treadmill while everyone gets off the treadmill, gets on the rower, gets back on the treadmill, and gets back on the rower. Then I finally reach my distance. Whatever. I am working towards betterment, even if I am the slowest one in the room! Every time I manage to run half a mile without stopping, I cheer in my head, even if I just did it two days ago. It’s still a huge deal for me. Once in a blue moon, I’m able to run a whole mile without a walk break, and it makes me feel like a million dollars! When I first started “running” back in May of 2013, I couldn’t even run 30 seconds without feeling like my chest was going to explode. I couldn’t run faster than a 17:30 minute mile. The thought of running 3.1 miles made me want to cry. Now it’s December of 2014. Just a year and a half later. Here I am a week ago on Thanksgiving morning. 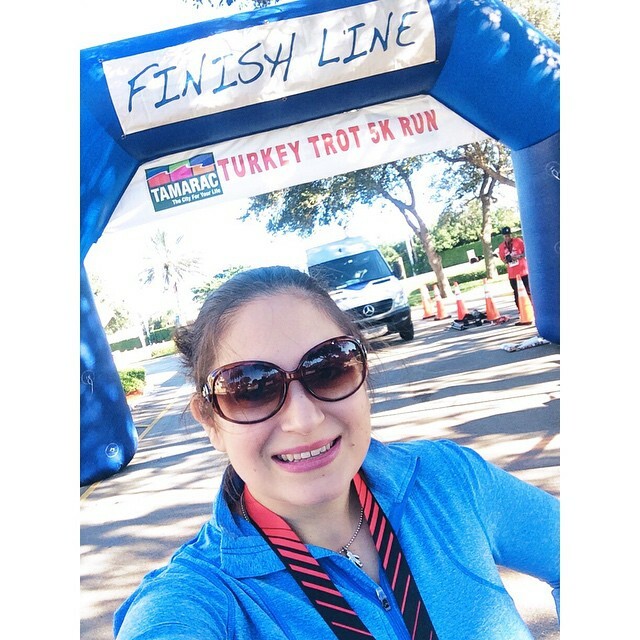 I ran the Tamarac Turkey Trot for the second year in a row. My time was 43:31. I shaved OVER 4 minutes off my last official 5K time, achieving a personal record. 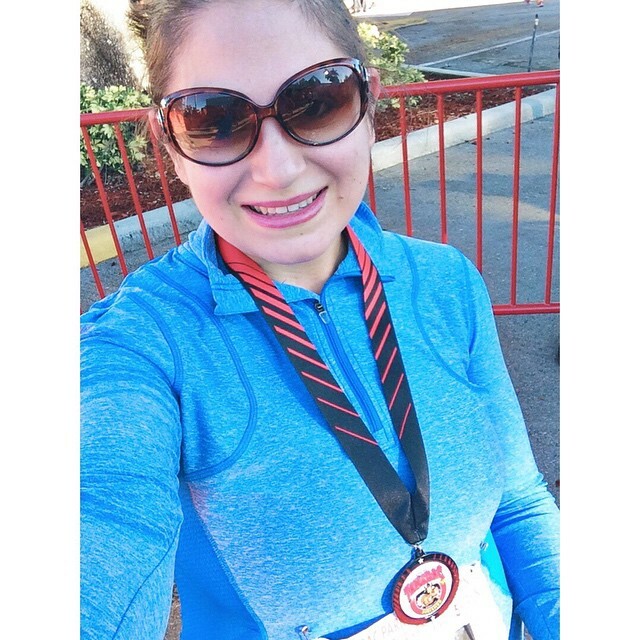 My average pace was 14:01 per mile! I could not be more proud of myself!! Yes, I may have gained a few pounds this year. I am definitely still not in perfect shape. I can change those things, for sure. I know I may not be the best runner, especially when I look at some of my friends and their 27 minute 5K times. That’s TOTALLY okay. So very proud of you and happy for you.